Episode 288 has Skyler giving his commentary on the following topics: whether unhealthy foods should be illegal; how he looks at the anti-vaccination movement; why the goal of racial diversity may unwittingly have people only seeing color; the similarities of government entitlements and human sacrifice; constitutions and the presumption of liberty; and more. 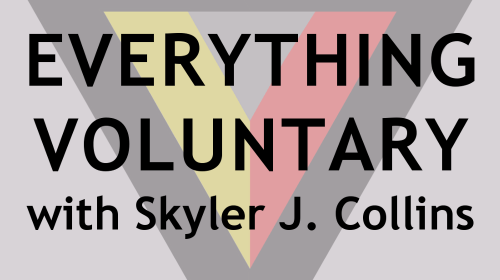 Episode 001 is an introduction to this brand new podcast hosted by Skyler J. Collins, which will feature bite-sized episodes exploring logical fallacies, cognitive biases, principles of Stoicism, and life pro tips. Subscribe via RSS here, or in any podcast app by searching for “thinking and doing”. Support the podcast at Patreon.com/evc or PayPal.me/everythingvoluntary. 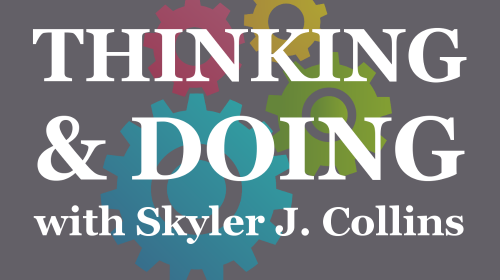 Episode 287 has Skyler giving his commentary on the following topics: his new podcast “Thinking and Doing” that will explore logical fallacies, cognitive biases, Stoicism, and personal philosophy; an article he wrote in July 2018 looking at the role social media companies like Facebook, Twitter, and reddit should play in policing speech on their platforms; and more. Episode 286 has Skyler giving his commentary on the following topics: Alexandria Ocasio-Cortez’s outrage over lobbyist trading with homeless people; an article he wrote in April 2009 on the mistakes of conceiving rights in a positive, tangible way (as versus a negative conception, or something that does not exist); and more. Episode 285 has Skyler giving his commentary on the following topics: a list of things teachers say to manipulate and control children in the classroom; he continues the Economics 101 mini-series with “opportunity cost”; he also continues the Wizard’s Rules mini-series with the fifth rule, “Mind what people do, not only what they say, for deeds will betray a lie”; and more.